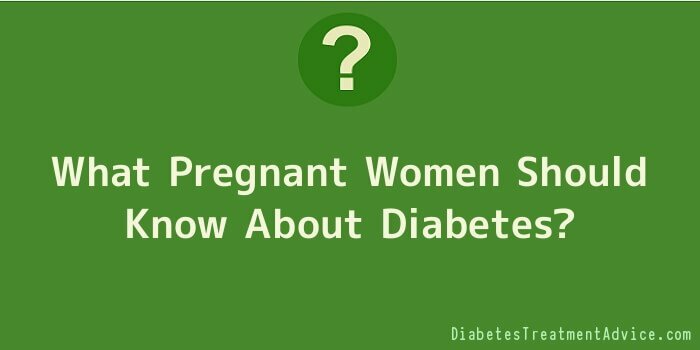 What Pregnant Women Should Know About Diabetes? A study showed that 4 out of 100 women would have gestational diabetes while they are pregnant. This may not sound alarming; but, if you are pregnant, you certainly would not want to take any chances. Being aware of this condition, as well as knowing its symptoms, would greatly help you and your child during the pregnancy stage. If you know the symptoms, you can tell your health care providers right away and avoid the complications of gestational diabetes. Like any type of diabetes, gestational diabetes occurs when there is an abnormal increase in the blood sugar level of a pregnant woman. This is very risky as complications would not only affect the mother, but also the child in her womb. It is absolutely necessary for the mother’s blood sugar level to be within a normal range to ensure that the baby does not grow too big and that problems can be avoided during the pregnancy and during the delivery. Gestational diabetes is a temporary condition, occurring only during pregnancy and stopping after childbirth, its possible lifelong complications should not all be underestimated. Additionally, the condition and its symptoms can be stopped during the period of pregnancy as long as there is careful control of the mother’s blood sugar level. Health care experts are still unable to determine the specific cause of the condition. But so far, it is said that the placenta releases hormones that are causing the body to resist insulin. Additionally, if the mother gains weight, her body would most likely experience insulin resistance. Again, you may not notice that these symptoms are already occurring that is why your doctor would recommend a test for it. As mentioned earlier, your doctor would ask you to undergo testing for gestational diabetes, especially on the 24th to the 28th week of your pregnancy. This is the oral glucose tolerance test. Your doctor would also immediately test your blood sugar level on your first prenatal visit if he or she finds that you have high risks factors of getting the condition. If the test would show a normal level of sugar in your blood, you will be tested for blood sugar level on your 24th to 28th week of pregnancy again. It is only when you do not have any of the high risk factors that your doctor would not necessitate a test. You have sugar in your urine. A body mass index (BMI) of 30 or more or whatever is considered overweight by your doctor. You’ve had gestational diabetes during your previous pregnancy. There is a history of type 2 diabetes in your family. Other risk factors that your doctor may look into are: you are more than 25 years old; You have too much amniotic fluid in your body; you are a Pacific Islander, Asian, Native American, Hispanic or African American; your blood pressure is high; you have pre diabetes; your baby is 9 pounds or more; you’ve had a stillbirth or miscarriage in the past; you have given birth to twins, triplets or multiples; your child when born had defects. Do not worry if you have been confirmed to have gestational diabetes. Most mothers with the condition would not have any serious problems during their pregnancy and their babies are very healthy. What you must be concerned of is you and your baby’s high vulnerability to developing diabetes in the future. Also, you might undergo a caesarean section during your delivery. If your pregnancies are subsequent, you are also susceptible to getting gestational diabetes and a known complication of diabetes, which is a high blood pressure. Another risk that you might be concerned of is macrosomia. This is having a baby with an excessive birth weight. This is not good as it may damage the shoulder of the baby during the delivery. You may also have problems with breathing and your blood sugar level may all of a sudden drop after your delivery. There might be an increase of risking a stillbirth in the future, which you would not like to happen. Stillbirth is when your baby is still a foetus and dies in your uterus. Mothers should not underestimate gestational diabetes especially when it comes to the effects that it has for the mother and their child’s health. If you have the condition, just make sure that you are in control of your blood sugar level by doing moderate exercises, monitor your blood sugar and take all the medications that your doctor would prescribe.